White Corrugated Mailers fold together quickly and easily without the need for tape, glue or staples. They are super strong and yet light-weight to save on postage. 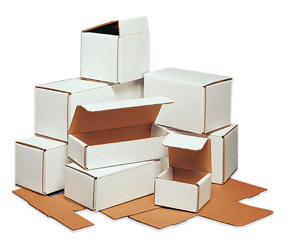 Corrugated Mailers are manufactured from 200#-B oyster white corrugated. When assembled, mailer provides doublewall protection on three sides. Dimensions below are inside dimentions. White corrugated mailers are the ideal solution for small and lightweight items that are fragile and need a little extra protection in transit. The boxes fold together quickly, which means that you don’t need tape or staples to hold them together, but it also means that you create a double layer of protection for the items inside. The corrugated cardboard is strong as is, but with the double layer on three sides of the box, you’ll create superior protection for your products. There’s enough room inside to pad your items with foam peanuts or foam sheeting if they need the additional protection. The boxes are easy to assemble, and they have a wave rule edge that reduces the risk of paper cuts to practically nothing. The final product is professional looking, creating a nice presentation for your customers when the box finally arrives on their door steps.